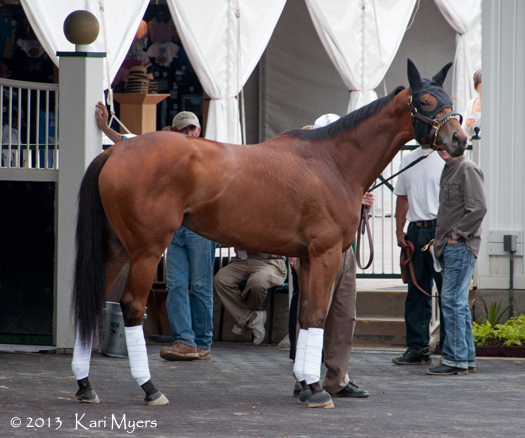 I’ve become such a fan of Beholder since her 2nd place finish in the Kentucky Oaks. I liked her before, but I just didn’t think she could get the distance and I certainly never gave her enough credit for her previous wins. She’s the 2 year old female champ from last year and she still went off at odds of 9 to 1! Her connections have said she’s a little quirky, and you’ll notice that she’s always wearing earmuffs. She had some trouble heading into the starting gate in the Oaks and almost fell to the ground, causing Garrett Gomez to jump off her because he thought she might go all the way down. Even after all of that, she still almost held on to win. What a gutsy filly. Beholder is a daughter of Henny Hughes out of the mare Leslie’s Lady, which makes her a half-sister to the Spendthrift stallion Into Mischief. 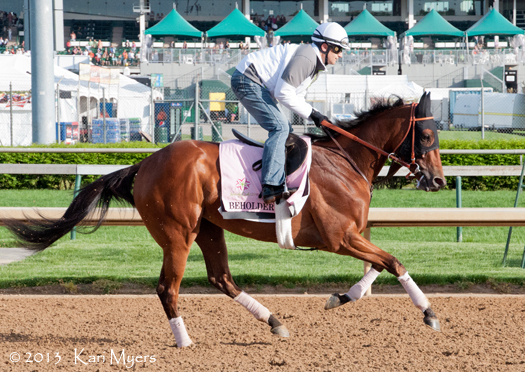 That’s of note because two sons of Into Mischief ran in the Kentucky Derby this year: Goldencents and Vyjack. What a talented family! 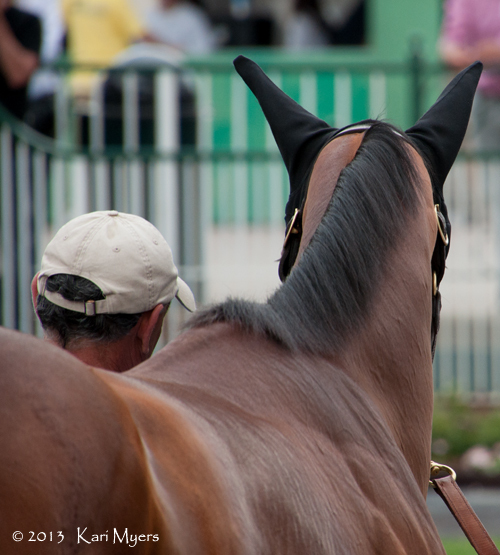 May 2, 2013: Beholder and her earmuffs.